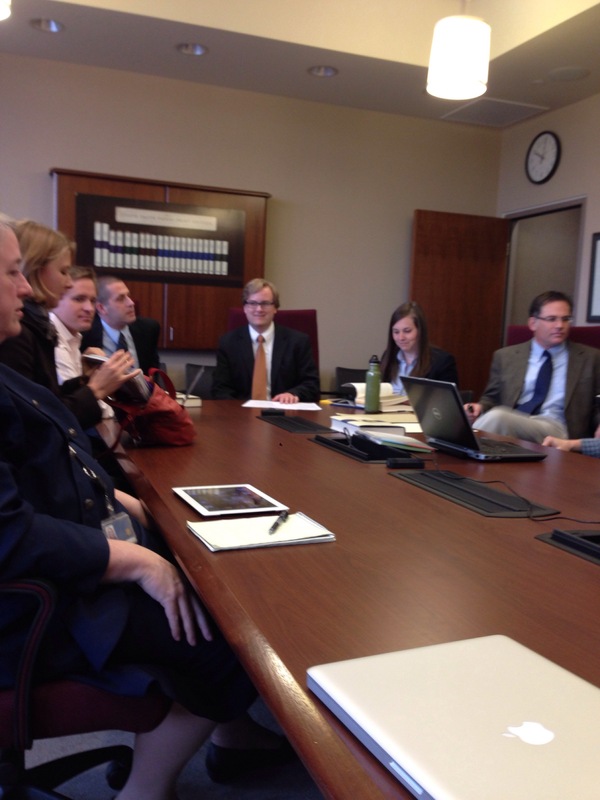 In about 15 minutes, the JSPP crew will be introducing volume 2 of the Documents Series of the Joseph Smith Papers. Volume 1 was released to the public a few weeks ago. I’ve read some of it, and it appears on its face to be of the same high quality as the previous volumes in other series. Eventually, I’ll put up reviews of these two volumes. Much of the content of these volumes, at least in volume one, consists of extractions from early collations of history and revelation items. For example, when early revelations from 1828-1831 were collected and copied into manuscript books (multiple entry documents), the autographical documents were discarded, perhaps reused, but eventually lost apparently. It remains to be seen of course if such documents might resurface in private hands, family collections or unexplored archival stores. Matt Grow doing introductions. Docs series is the core series of the JSP, revelations, letters, minutes, reports of sermons, docs 2 goes from July 1831 to Jan 1833. The first 2 vols. should be the most useful for church members and the first two volumes contain mostly revelations. 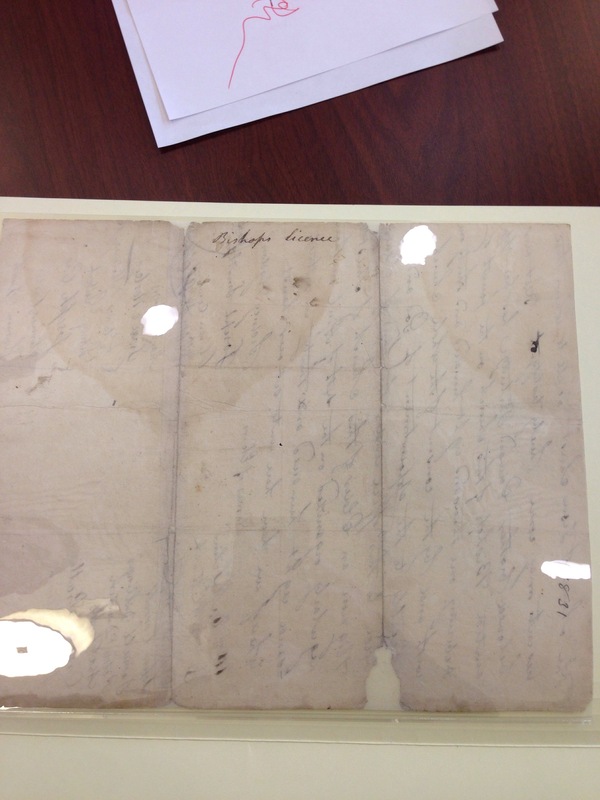 Online updates: Lucy Mack Smith manuscripts, and many of the materials for the docs series. Coming up for the JSPP website early next year, docs through 1842, 4 reports of KFD, coming up for the website, josephsmithpapers.org. Next year: 3rd volume of the documents series. 2015: Book of Mormon printers manuscript in two physical volumes, and at the end of the year the 3rd vol. of the journals series, incorporating the much talked about Council of Fifty minutes. Documents vol. 2 begins with the revelation designating Jackson County as Zion. Docs. vol. 2 shows the interplay between Ohio and Missouri, tensions over migration, etc. The volume is very Zion-centric in its contents with insights into the logistics of the enterprise. Two letters from JS to Emma appear in the volume that reveals some of the personal aspects of his family and his hopes and desires. Three revelations: D&C sections 76, 84, 88 are important doctrinal revelations that appear in the volume. These are, as noted above, extracts from early copies. Mark Ashurst-McGee, another volume editor: Talks of the two letters to Emma, these are important since they are preserved in JS’s own hand. June 6, 1832, JS’s fingerprints appear as he tried to wipe erase errors. 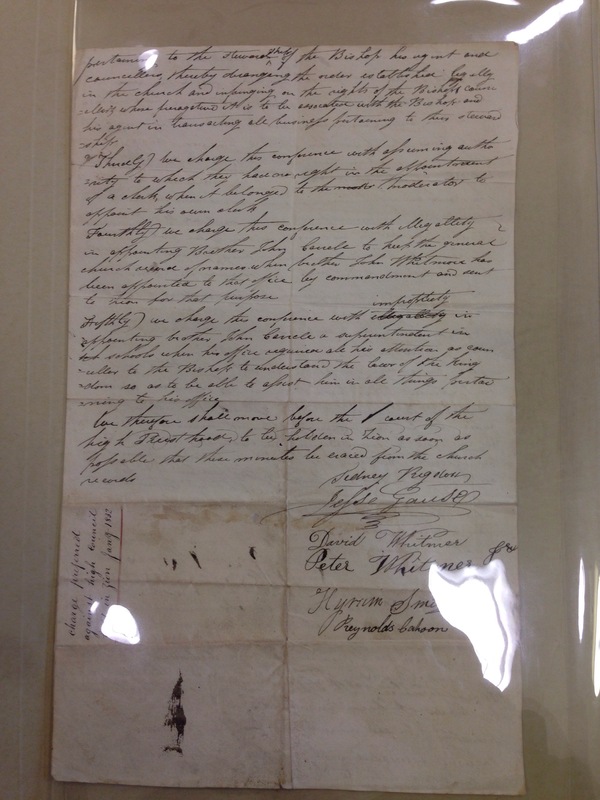 Charges against Missouri conference in 1832–more on the dynamics between Ohio and Missiouri. MAM shows the original letter-contains signatures of JS, Rigdon, Hyrum, Peter Whitmer Jr, Reynolds Cahoon and the elusive Jesse Gause. A Treasure trove of signatures. Probably written in Hiram, Ohio, then carried to other locations for signing. Another original letter, appears to have been signed over time. Forensic analysis shows the document was created in Ohio, X-ray studies show that other signatures were written in different ink. 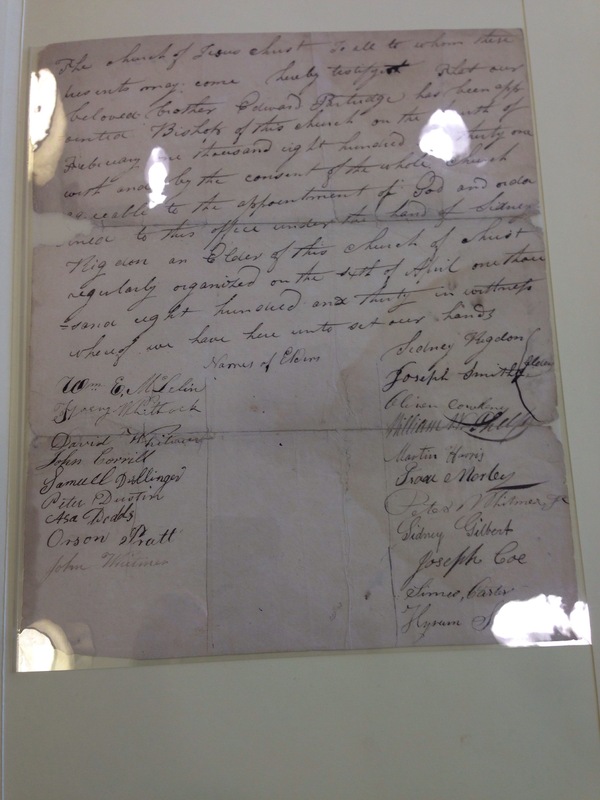 A probable revelation autograph is found in docs 2 and it shares a fascinating dating analysis with some other documents through 1836. I believe MAM spoke about this one at the MHA conference earlier this year. Riley Lorimer is up: women in docs 2. JSP materials is male heavy for more or less documentary reasons. Two documents pertaining to women: revelation Feb. 1832. Rights of women when husbands who had consecrated property to the church died. Missouri laws prevented full inheritance to females-treated as one of the children, etc. The revelation states that widows have claim on any properties that were held by the deceased. January 1833 minutes of the first meeting of the school of the prophets: women were present in the opening meeting, great outpouring of spiritual gifts. Glossolalia, etc. The following day of ceremonial washings excluded women. Because of male-centric records, women are lost from the story of the original records. Editors have tried to recover some of the female stories and details. Matt Grow, on backmatter and individual document introductions. 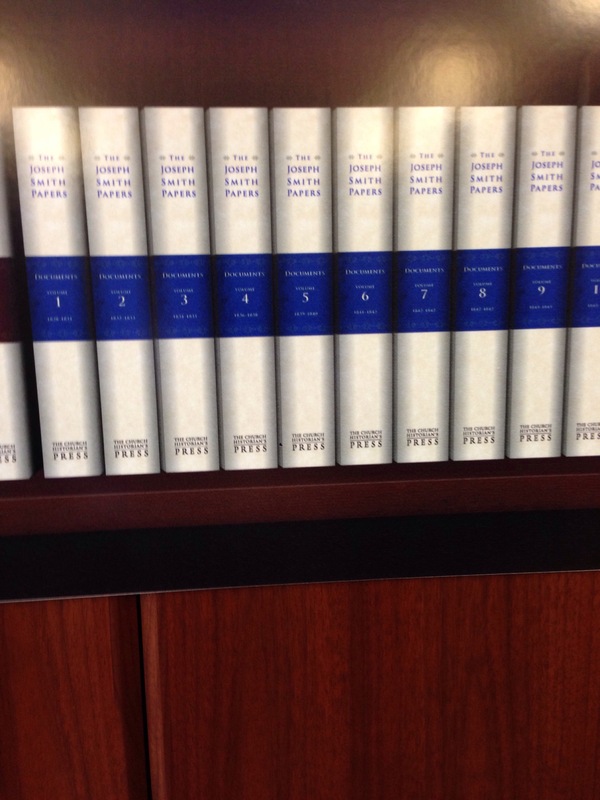 The volume should be a great addition to our sourcing for church education. Matt mentioned the excellent cooperation between CHL and the Community of Christ archives. The latter allowed new images of the Book of Mormon manuscript for the JSPP. The Book of Mormon ms volumes should be fabulous. And expensive, I’m guessing. During the Q&A, Matt noted that the volumes are written for scholars by design, but the hope is that they will set some boundaries and open some doors for church publications in the future. The Q&A was interesting, though I’m afraid I hogged most of it. This period is foundational for so many reasons. Below are some images from the event. Thanks for the notes, WVS. Would have loved to hear the Q&A (grin). Q&A was fun. I didn’t get notes for that. Thanks for the notes! Just one volume next year? I’m 100 pages into D1 and blown away so far! Can’t wait for your reviews. n8c, the goal is two volumes a year, and in taking notes, I probably missed something for 2014.